Subtle stamping attempts that went too subtle! | Light Your Nails! I quite like both looks. 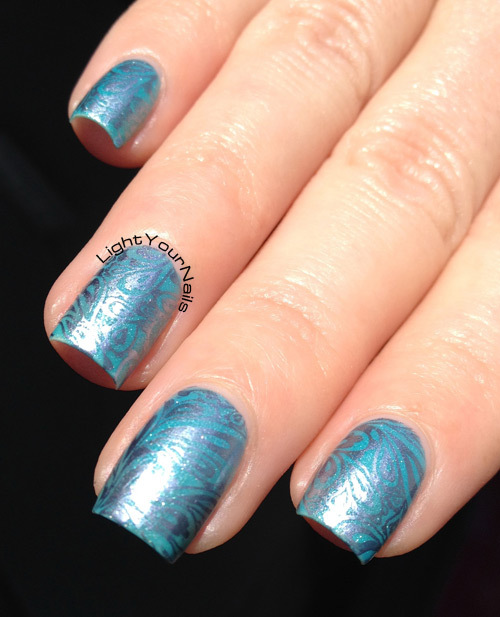 I was thinking that if you stamped the first look with a silver holo like color club's harp on it, it might compliment the sparkly base quite well while still achieving the subtlety you crave. For the second look you can try stamping with either the sally Hansen foils or models own if you have it with either the blue or teal one. Can you keep us posted on your progress? I will for sure! Subtle stamping is something I like so much that I'll never give up attempting! The first mani is great! The one finger looks as if there were precious gems on it! La cosa bella dello stamping è che non si sa sempre come viene fuori, è una sorpresa! In ogni caso a me il risultato piace, e molto anche! I like the first attempt better, but I have to mention that both one are very pretty! A me però piacciono molto...entrambi! Non saranno usciti come avevi preventivato, ma son molto belli entrambi! In casa sì... ma appena uscivo al sole scomparivano! Eheh io stampo sempre con quello che ho sulle unghie, credo anche tu, quindi cerco di adattare il colore sopra! i love the subtle stamping look as well but never seem to accomplish it!! lol I think yours still look great! oh my. That stamping! You are my mermaid inspiration! I definitely have a few too subtle stamping manis under my belt as well! I love subtle stamping but it can be so hit or miss. I am learning that the bad way! I've had a few that have turned out a bit too subtle but oh well! I guess fails are needed as well!? Even though they are quite subtle, I like them both! Normally Im not a huge fan of subtle stamping but I have to say I am in love with that first look. Hehe, I know what you mean, I too have fallen victim to TOO subtle stamping. These look great in photos though, but I know that sometimes they don't show up well in real life. Yeah, they were so subtle in real life, and became completely invisible if I went outdoors under direct sunlight!